Changes or modifications not approved by the manufacturer could void the user's authority to operate the equipment. These limits are designed to provide reasonable protection against harmful interference in a residential installation. This equipment generates uses and can radiate radio frequency energy and, if not installed and used in accordance with the instructions, may cause harmful interference to radio communications. However, there is no guarantee that interference will not occur in a particular installation. If this equipment does cause harmful interference to radio or television reception, which can be determined by turning the equipment off and on, the user is encouraged to try to correct the interference by one or more of the following measures: Reorient or relocate the receiving antenna. Increase the separation between the equipment and receiver. Connect the equipment into an outlet on a circuit different from that to which the receiver is connected. This automatically ranging digital multimeter that measures AC/DC voltage, AC/DC current, and resistance. It can also measure temperature, capacitance, frequency, duty-cycle, test diodes and continuity. Exclusively designed from the ground up by electricians for electricians. Years of field research, combined with extensive input from electricians across America, inspired the development of metres loaded with innovative, time-saving features. The Milwaukee Digital Multimeter features a category III 600V rating for safety. 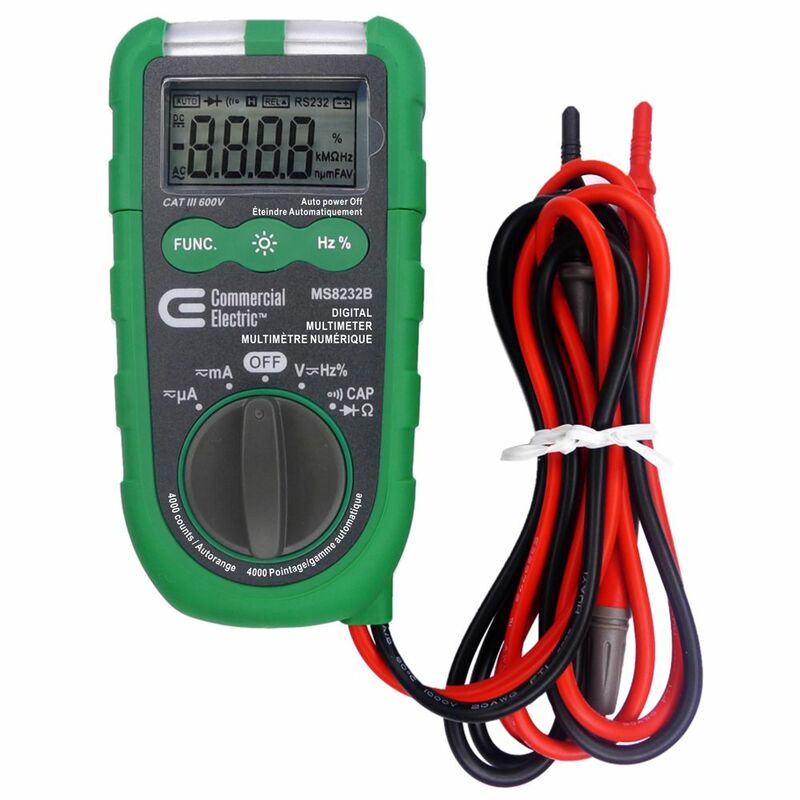 The multimeter has a rugged over-moulding for user grip and durability and is auto-ranging to millivolts. This meter provides audible- and visual alerts to let you know when voltage is present and features a wide voltage range to 600 volts AC or DC. Detects potential conditions for mould growth. Auto-Ranging Digital Multimeter Changes or modifications not approved by the manufacturer could void the user's authority to operate the equipment. These limits are designed to provide reasonable protection against harmful interference in a residential installation. This equipment generates uses and can radiate radio frequency energy and, if not installed and used in accordance with the instructions, may cause harmful interference to radio communications. However, there is no guarantee that interference will not occur in a particular installation. If this equipment does cause harmful interference to radio or television reception, which can be determined by turning the equipment off and on, the user is encouraged to try to correct the interference by one or more of the following measures: Reorient or relocate the receiving antenna. Increase the separation between the equipment and receiver. Connect the equipment into an outlet on a circuit different from that to which the receiver is connected. Auto-Ranging Digital Multimeter is rated 3.0 out of 5 by 33. Rated 4 out of 5 by NW from Great product. The only issue so far is that the... Great product. The only issue so far is that the plastic around the ends of the probes is a little too thick, so it can be challenging to make contact on small surfaces. I'm may decide to sand/whittle down that plastic to make mine easier to use. Overall this is product works as expected. Rated 5 out of 5 by scottopp from works great!... works great! Rated 5 out of 5 by Army from This Product was easy to use,i will definitely recommend it to a friend. This Product was easy to use,i will definitely recommend it to a friend. Rated 5 out of 5 by Ryan from Great item.... Great item. Rated 4 out of 5 by MultimeterReviewer from Small and easy to use, my only problem is that the maximum current it can measure is limited to 4... Small and easy to use, my only problem is that the maximum current it can measure is limited to 400mA, what a joke? Rated 4 out of 5 by Superdave from Needed hz reading, this meter fit the bill. Needed hz reading, this meter fit the bill.